Despite a common image of an overworked, grumbling about pay teacher, several different studies around the globe independently revealed an amazing fact: people who choose to be teachers are happier than the majority of other professionals. Below is our latest high res print-friendly poster. If you like it and think it's worth spreading, share the link on Facebook, tweet about this poster, pin it onto your Pinterest board, or email it to your fellow teachers! Happy teaching! Found it helpful? Please share! 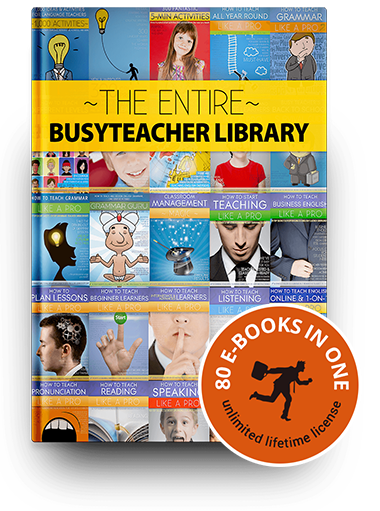 Includes the best of BusyTeacher: all 80 of our PDF e-books. 4,036 pages filled with thousands of practical activities and tips that you can start using today. Instant download, 30-day money back guarantee. Get it now and start reading in 3 minutes!